More second hand fabric. The red with roses has a bit of plastic feeling to it. The yellow swirls makes me smile. The white with rose stripes was a must-have, as the pink and gray 50th style fabric. Mmmmm! Loppis behind Kyrkstugan one day! 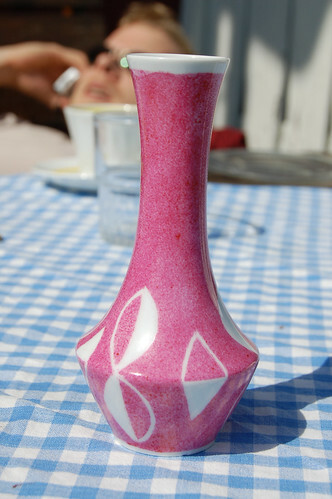 A small pink vase, that was to cute to resist. Looks so cute with flowers in it. From Emmaus. 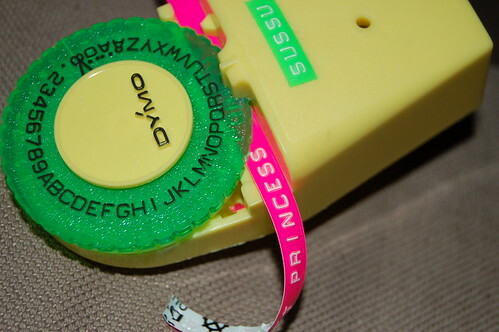 A children’s Dymo with text strips in pink, green and yellow! Wooohoo, so fun! From Kyrkstugan. Not a thrift, but a true find! 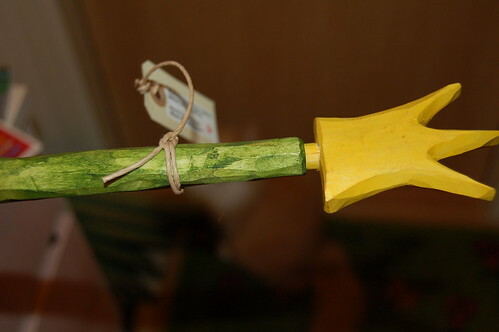 Maria’s garden sticks, hand carved and painted. A present for my mother and father when I go visit them in July. Not a thrift, but cheap yarn from Obs. 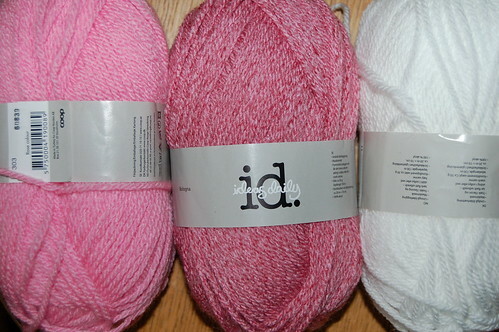 Pink, pink and white. A Hello Kitty something perhaps? This entry was posted in Pretty things, Thrift & Recycle and tagged fabric, thrifted finds, yarn. Bookmark the permalink. I just thrifted a dymo label maker myself this week–99cents! I only got one roll of green tape with it. I hope they still make the tape! Lovely finds – the fabric is all so pretty. But that vase is so chic! Isn’t thrifting fun? Great thing this dymo – I would like to find one too… Actually, I go to Sweden in 5 days – for 2 weeks holiday – and I will be very aware if I should see some sign saying: “Loppis”. I?m going to stay in a house in Sollentuna at Stockholm, so you are welcome to give me a hint if there is anything in that area you know, I just MUST go and see. 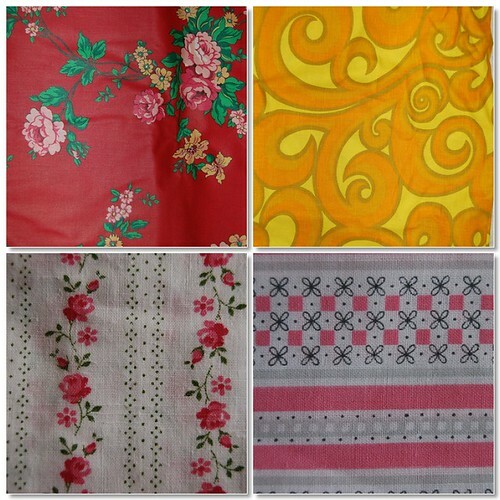 I?m in love with rose-striped fabric! And the garden stick! How very beautiful! I?m curious to see what you will do with the wonderful fabrics! Hmm…maybe I’m gonna go triftshopping today! OT: About the swap, I’m in the middle of making some buttons and others stuff. As that’s ready for swap, I’ll mail you! Haha! Min f?rsta kund i kyrkstugan kanske?